If you want to remove tiles Windows 8 , you do not need anything more than the Start Screen, and two clicks to accomplish it. Right click on one or more tiles. A command bar will appear at the bottom of the screen. Note that you have not deleted the apps themselves, but only their link to the Start Screen. They are still accessible through the apps page. 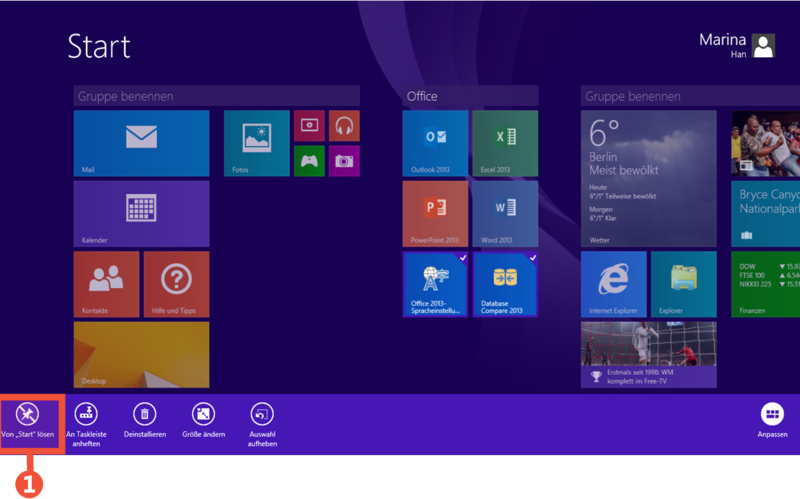 Why remove tiles in Windows 8? There are several reasons why you may have to remove tiles from your Start Screen. Perhaps some tiles were pre-set and you do not use them. Maybe previous tiles that you anticipated will be in regular use are not anymore. In any case unused tiles crowd your Start Screen and to maximize the feature, we recommend you remove them. Some tiles are outdated, create new ones. Like many other computer issues, such as Creating a backup, you should also check your Start Screen regularly. Useful tiles facilitate productive computer working time while idle tiles contribute to inactivity and confusion. For more useful tips about Windows 8, you can download the free trial version of DarWin8 , get it from the Windows Store and take advantage of Windows 8’s new features.